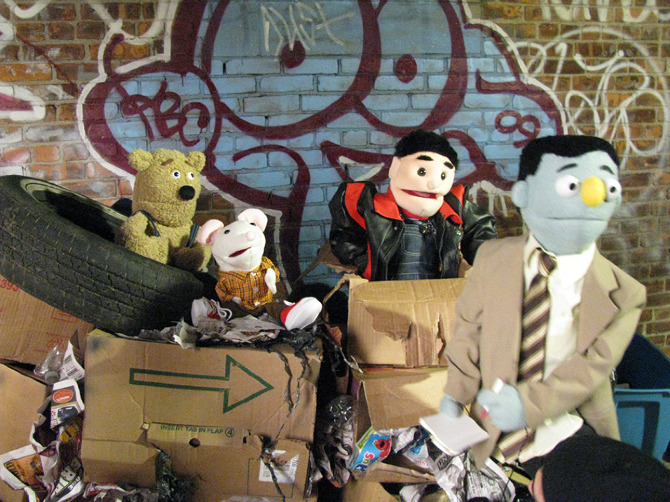 For fans of Trailer Park Boys, Wilfred, and Sesame Street, comes The Fuzz, a grown up cop show about drugs, gangsters, and violence, told with the help of hand puppets, and jelly beans. I recently discovered a web series called The Fuzz. I’ve only watched the first season but it seems funny enough. It’s a surreal, subversive, satire (I’ve run out of sibilance) about a drug problem in a parallel present day. Set in Brooklyn, the narrative involves hand puppets, a neighbourhood torn apart by gangsters peddling dangerous drugs, and one police officer who can set it all right. It’s a standard story, one that’s immediately familiar to fans of police procedurals like The Wire and Aquarius, but The Fuzz tells its tale through a collision of narrative types. In The Fuzz there are two distinctive social groupings – there’s the run of the mill, archetypal humans, and then there’s the badly integrated hand puppet community. The hand puppets are maligned, ostracized, and mistreated, and their neighbourhood is engulfed in gangland violence, with drugs (jelly beans) sold on every street corner. After a particularly nasty shoot out the authorities are under pressure to put a stop to the violence, so the police chief (Dorothi Fox) forms an impromptu task force made up of an over weight useless human detective (Jon Gabrus), and a high achieving, intelligent, puppet police officer (David Fino) given temporary detective status. Their job is to pose for pictures and look like they’re investigating the crime, but really they exist simply to mask the police department’s corruption, especially when dealing with puppet on puppet crime. 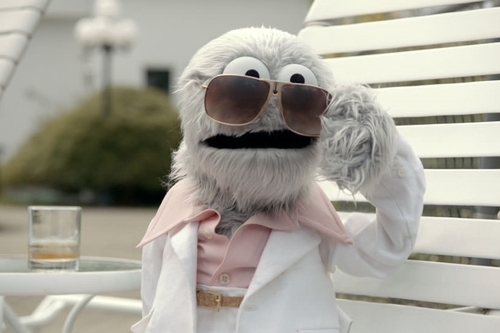 Watching The Fuzz is a decidedly strange experience, and for the most part the choice of puppets works well. They stand in easily for real world minority groups, and their problems are immediately relatable. But it’s also a straightforward comedy, which relies on its contexts and situations to generate most of the laughs. It’s not always an imaginative show in terms of its execution (although the concept clearly is), but it makes up for it with clever dialogue, and amusing turns of phrase. Rainbow Brown in The Fuzz. cop is forced to go undercover to get to the bottom of the violence in Puppet Town, and his story runs parallel to his childhood friend, now a violent, drug addicted puppet called Rainbow Brown (Peter Bradley) at the top of the organised crime ladder. The bizarre juxtaposition between naïve Sesame Street influenced dialogue cues, and the violent, and corrupt setting functions well for the most part. Often though it’s the human actors that let the show down with their wooden delivery – but they’re acting alongside puppets so some of that can be forgiven. The first season is currently on Netflix, UK, and for cult TV fans it comes highly recommended. It’s Rasta Mouse all grown up, with a touch of Spaced thrown in for good measure. If only real world violence was as cute as its representation in The Fuzz and its junkie puppets are far more endearing, sweet, and cuddly than their human counterparts. But for all of its cute puppet culture, their propensity to break into song, and their sugar infused ‘hard drugs’, there’s a distinctly adult tint to the narrative as it progresses. They might look cuddly, the puppets have an unexplained love of balloons, but they’re just as warped, badly behaved, and solipsistic as we are. This makes for some simplistic didacticism, amongst the niche humour, and unusual storytelling choices. Previous Previous post: Remember the Noughties?